Roasted radicchio, romaine, and cannellini salad, spinach salad with roasted carrots and broccolini, and roasted artichoke, orange, and radish salad. 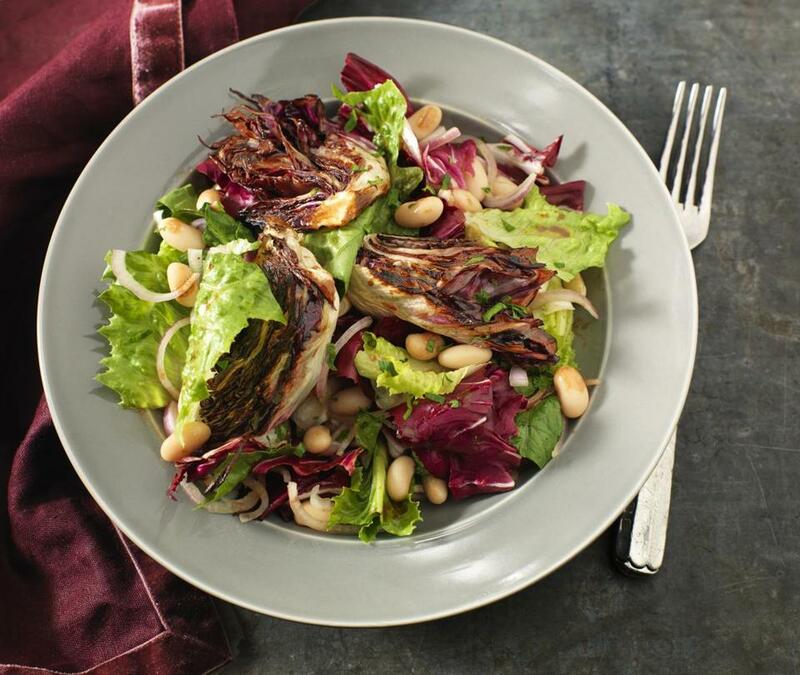 Roasted radicchio, romaine, and cannellini salad. Salads that pair roasted vegetables with fresh greens set up alluring textural contrasts — the soft, tender, silky qualities of the roasted veggies against the crisp, refreshing leaves. Flavors benefit as well, with roasted vegetables bringing mellow, caramelized notes to contrast with the greens’ bright, herby mineral tang. With complementary dressings and accents, these salads both engage the senses and bridge the seasons as we move from cool to warm weather. In a small bowl, cover the shallots with cold water and set aside to soak. Meanwhile, with the rack in the center position, heat the oven to 475 degrees. Trim the radicchio, then pull 3 or 4 outer leaves from each head, wash, dry, tear up, and reserve. Halve each radicchio head lengthwise through the core, then cut each half into 3 wedges, leaving some core in each wedge so the leaves stay together. Brush the wedges with 3 tablespoons of the oil and sprinkle lightly with salt and pepper. Arrange cut sides down on a large baking sheet and roast until wedges begin to wilt, about 9 minutes. Turn wedges, rotate baking sheet, and continue roasting until browned and tender, about 9 minutes longer. Remove from oven and cool. Meanwhile, in a small bowl whisk together the balsamic vinegar, lemon juice, mustard, garlic, ¼ teaspoon salt, and pepper to taste, then whisk in the remaining oil. Drain the shallots and blot dry with paper towels. In a large bowl, toss the romaine and raw radicchio with most of the dressing. Taste and adjust the seasoning if necessary. Add the beans and shallots, and toss lightly to coat. Transfer the salad to a serving platter, arrange the roasted radicchio on top, drizzle with the remaining dressing, sprinkle with parsley, and serve at once. With the rack in the center position, heat the oven to 400 degrees. In a large bowl, toss the carrots with 1 tablespoon oil, ¼ teaspoon salt, and black pepper to taste. Spread them in a large rimmed baking sheet, cover tightly with foil, and roast for 10 minutes. Meanwhile, in the same bowl, toss the broccolini with the remaining oil, ¼ teaspoon salt, and black pepper to taste. Remove the baking sheet from the oven, uncover the carrots, toss, and arrange them over half of the sheet. Add the broccolini to the empty half, and continue roasting until carrots and broccolini are tender, about 10 minutes longer. Remove from the oven and cool the vegetables to room temperature. Meanwhile, in a small nonreactive bowl, whisk the tahini, lemon zest and juice, soy sauce, garlic, minced scallion whites, cayenne, ¼ teaspoon salt, black pepper to taste, and 2 tablespoons water until uniform. Taste and adjust the seasoning with salt, black pepper, or lemon juice, if necessary. In the large bowl, toss the spinach with most of the dressing to coat well. Add the roasted carrots and broccolini and the scallion greens, and toss lightly to coat. Transfer the salad to a serving platter, drizzle with the remaining dressing, sprinkle with the sesame seeds, and serve at once. 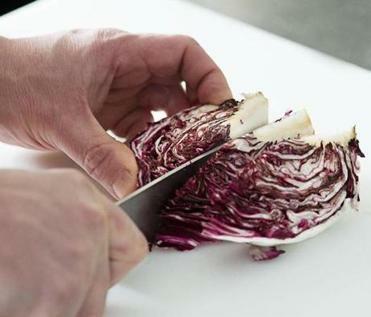 Cut radicchio wedges so that a little piece of core remains in each wedge to help hold it together. With the rack in the center position, heat the oven to 450 degrees. In a large bowl, gently toss the artichokes with 2 tablespoons oil, ¼ teaspoon salt, and pepper to taste. Arrange cut sides down on a large baking sheet and roast until cut sides are browned, about 12 minutes. Turn the artichokes, rotate the sheet, and continue roasting until both sides are browned, about 12 minutes longer. Remove from the oven and cool. Meanwhile, cut the peel and pith off the oranges and cut crosswise into thin slices. Set slices aside. In a small nonreactive bowl, whisk the orange zest, lemon zest and juice, mustard, garlic, ¼ teaspoon salt, and pepper to taste. Whisk in the remaining oil. In the large bowl, toss the lettuce with most of the dressing to coat well. Taste and adjust the seasoning if necessary. Add the roasted artichokes, parsley, and radishes, and toss lightly to coat. Transfer the salad to a serving platter, arrange the orange slices on top, drizzle with the remaining dressing, and serve at once.